Preheat oven to 350 degrees. In a food processor, pulse sugar until super fine, about 2 minutes (if you don’t have a food processor caster sugar should also work). In a mixing bowl, sift together half of the sugar, the cake flour and the salt. In a large mixing bowl, whisk together egg whites, water, extract of choice and cream of tartar until well combined, about 2 minutes. Switch to a hand mixer and whip mixture on medium speed while slowly adding remaining sugar to mixture, until medium peaks form. Sift just enough of the flour mixture in to evenly dust the top of the egg white mixture and using a spatula gently fold flour layer into egg white mixture and continue this process until all of the flour mixture has been incorporated (I did this in probably 12 batches). Divide batter among paper lined muffin cups, filling each cup nearly full. Bake in preheated oven 18 – 20 minutes until golden and toothpick inserted into center comes out clean. 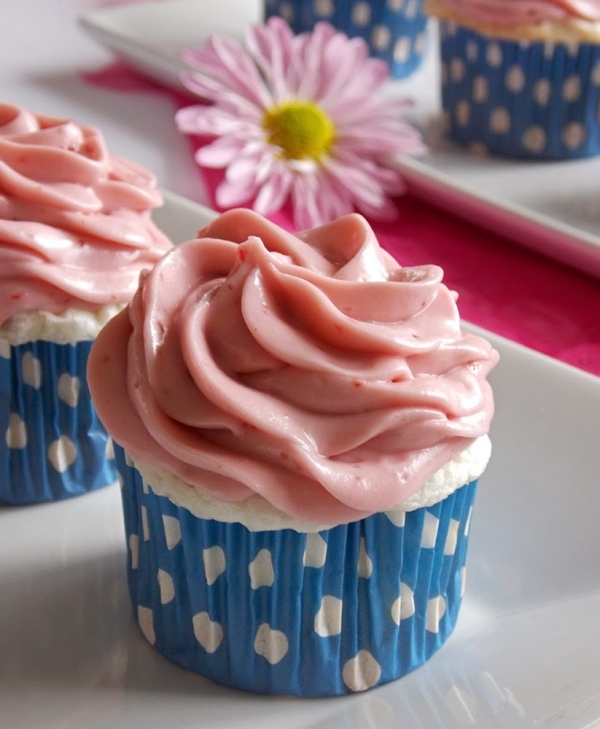 Cool completely then spread Cream Cheese Whipped Cream over cupcakes just before serving and top with fresh fruit. In a mixing bowl whip heavy cream until soft peaks form. In a separate mixing bowl, whip cream cheese until light and fluffy. Add cream cheese to whipped cream along with powdered sugar and whip until stiff peaks form. Store in refrigerator. *I’d recommend working with one egg in a bowl at a time to separate the yolk and white, then pour that separated white into the mixing bowl and continue that process with remaining eggs. I do this simply in case one of the yolks breaks and gets into the whites then you’ll only have to toss out 1 egg and not all of them if you can’t get the yolk out. You don’t want even 1 drop of egg yolk in the cake mixture or it can prevent the whites from whipping to stiff peaks.